No matter if you own a 4, 6, or 8-cylinder vehicle, there has probably been a need for a jump starter, either with your vehicle or someone else’s. This is why you need to read this review. A jump starter is an imperative piece of technology that is easy-to-use and helpful in other ways, too. But, with so many options in this day and age, it is hard to know which brand to trust. Without a doubt, Schumacher jump starters are the way to go. This review will help you navigate which jump starter is right for you. Before buying a Schumacher jump starter, you first need to know what you are looking for. Read our detailed review to find the right one for you! The Schumacher SL1316 portable jump starter charges 4-6 cylinder cars, power sport vehicles, and motorcycles. As a unit, the jump starter is 75% lighter than other leading lead-acid starters, since its one of the best lithium jump starter editions. When complying with industry standards, this model uses Schu Eco Energy, it is DOE compliant, and you can take it through security and not worry about getting through TSA. 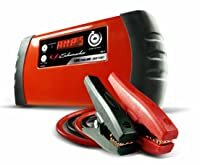 This lithium-ion jump starter is great to get your vehicle up and running again, as well as any other technology you need to power up. However, remember this device is only an engine start assist, not a full jump starter. If your boat, motorcycle, or smaller vehicle goes dead, this is the jump starter unit for you. With a 1000 amp jump starter, you can expect your battery to get restarted and last longer. As a lithium-ion phosphate battery, more charging cycles and longer battery life will ensue. The output uses a 12V DC, and the cranking current runs at 225A. Ultimately, if the battery is not discharged or frozen, this jump starter will get the job done right. Just make sure that you charge this jump starter periodically to make sure it works for you when you need it most. The Schumacher DSR114 DSR Pro Series is a great option if you need to jump-start an AGM (high output), CA (525), and/or a CCA (350) battery. It also includes a USB port, 12V DC outlet, a digital display, and an automatic charger. This car jump starter is the real deal. It has 2200 peak amps, and an on and off switch for added ease during the most difficult of situations. With a reverse connection warning, this machine will tell you if you have the cables misplaced on the battery. Safety is Schumacher’s main goal when they create their products. Expect this jump starter pack to crank dead batteries in bigger vehicles like trucks and SUVs. Semi trucks can even be jumped with this amazing device. By using the 2AMP charger, a typical extension cord does the trick to charge and use this jump starter. If you have any problems at all with this product, Schumacher jump starter has a warranty. The 1-year warranty will help with the product getting fixed or completely replaced if need be. 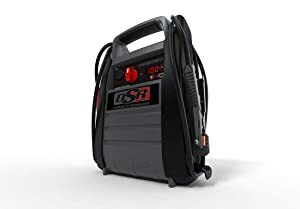 As one of the best jump starter options on this review, you should definitely consider this as a top selection. The Schumacher SJ1332 is a jump starter with air compressor. This compressor works on V8 engines, has a 1200 amp peak, 150 PSI compressor with pressure gauge, and an on an off starter switch. As a best car jump starter choice, this Schumacher is a portable power source whenever you are in need. The built-in charging system charges the internal battery and only needs an extension cord for recharging. The clamps are Sure-Grip technology that stays attached no matter if battery connections are on the top or side. On the LED screen, it tells users the status of a battery, and how much of a charge the battery needs. Even in the coldest of weather, the cables on this jump starter are flexible. When you are done using the battery, you can store this product safely because the lead-acid battery is sealed appropriately. Of course, if your tires are flat, this is a two-in-one machine that can pump up to 150 PSI. You will enjoy the digital display that is easy-to-see to keep you focused on your work. When looking for the best car jump starter, this may be your best bet to consider for you and your lifestyle. Now is the time for you to make a decision. 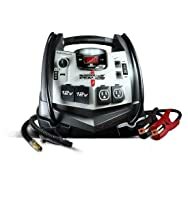 By using this review, you can navigate through the massive amount of Schumacher jump starter to pick the right one. Schumacher has been around since 1947 and continued to create quality product year after year. You won’t go wrong with any Schumacher selection. © 2019 Battery Focus. All Rights Reserved.